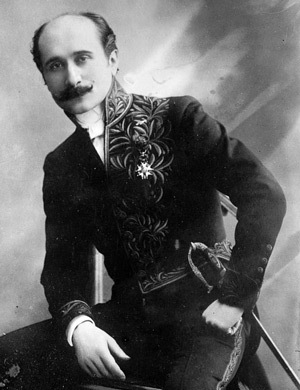 Edmond Rostand was born in 1868 in Marseille and wrote plays and poetry for 30 years before his death in 1918. The Rostand family came from the Provençal village of Orgon, on the road from Avignon to Marseille. His great-grandfather, Alexis-Joseph Rostand, was 20 years old when the French Revolution and its concomitant warfare swept the country at the end of the 18th century. He fought with some distinction in the Eastern Pyrénées during these years, before establishing himself as a key member of Marseille’s post-Revolutionary bourgeoisie. A merchant and politician, he held a number of public offices, including time as Marseille’s mayor. Alongside his public duties, Alexis-Joseph was a writer and musician, the first performer of Beethoven’s string quartets in Marseille. And the Rostand family tree carried on this tradition, they are largely noteworthy for their consistent combination of the mercantile and the artistic – they are bankers and pianists, writers and merchants. Edmond’s father, Eugène, had been a promising poet when he was young, a Latinist and translator of Catullus. But he turned his back on poetry to take up economics and became the head of the regional savings bank in Marseille. He wanted his son, who he called Eddy, to be a lawyer but Edmond displayed a keen interest in theatre and poetry. While at Collège Stanislas in Paris, Rostand studied history, philosophy and French literature. He completed a law degree but, unlike his father, never lost focus on his creative pursuits. He spent most of his time on poems and short stories, which he published in a literary review called Mireille. Rostand’s first play was Le Gant Rouge (The Red Glove), produced in 1888. In 1890, he married poet Rosemonde Gérard and published a volume of poetry called Les Musardises (The Idlers). In 1894, he produced his first truly successful play, Les Romanesques (The Romantics). Rostand produced his greatest work, Cyrano de Bergerac, in 1897. The play won immediate critical acclaim with its first production at Théâtre de la Porte-Saint-Martin in Paris. The success was repeated by L’Aiglon (The Eaglet), a tragedy based on the life of Napoléon’s son. Sarah Bernhardt played the title role during its first run in 1900. Bernhardt also acted in La Princesse Lointaine (The Faraway Princess) and La Samaritaine. Rostand, in fact, was one of Sarah Bernhardt’s many lovers. In 1901, Rostand was elected to the Académie Française. In 1914, he was refused entrance into the French army due to poor health. Due to his failing health, Rostand retired to the Basque country in Southern France. He spent the remainder of his life writing plays and poetry. He died aged 50, a victim of the 1918 flu epidemic.